Robin Thicke and Paula Patton's marriage was "unravelling for a long time," according to sources close to the couple, who announced their split on Monday. 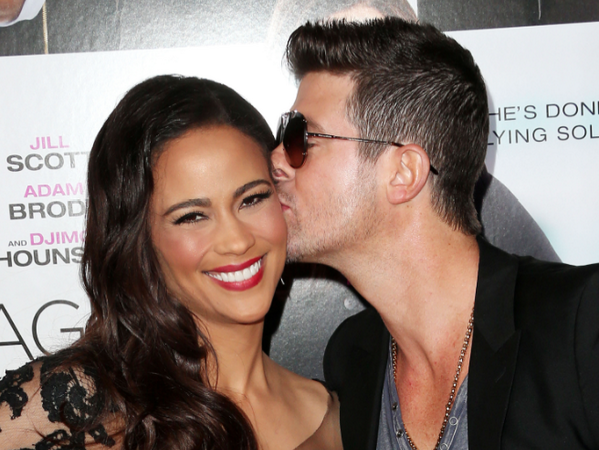 Robin Thicke and Paula Patton's marriage was "unravelling for a long time". The Mission: Impossible - Ghost Protocol actress and her husband of almost nine years announced they have separated yesterday, but friends claim they predicted the split. A source told UsMagazine.com: "It has been a long time coming. It is not a shock to Robin or Paula, and it is something they have discussed for a long time." Another insider said: "Their marriage was unravelling for a long time." Rumours that Robin had cheated on his wife date back as far as last August, but none have ever been acknowledged by the Blurred Lines star. Notably, he was photographed with his hand on the bottom of a fan, Lana Scolaro, in September, and she claimed he had also kissed her at the same party in New York City. Robin (36) and Paula (38) had put on a united front despite the rumours, making frequent public appearances together. Speaking to Prestige Hong Kong magazine last September, Paula said of her husband: "I've been there for his down moments and he's been there for mine. Life is full of peaks and valleys. Robin has always been a great person to remind me to celebrate now." The couple - who have a three-year-old son, Julian Fuego Thicke - said in a statement announcing their split they will always "be best friends," but "have mutually decided to separate at this time."